Try to describe a recent dream to someone and the details are likely to dissolve into absolute nonsense. Dreams themselves are ephemeral, fleeting and altogether mysterious. But trying to figure out the connections between different events in the dream and certain components of reality can prove even more confusing than the dreams themselves. This incredible project perfectly embodies the beautiful confusion that is the dreaming mind. 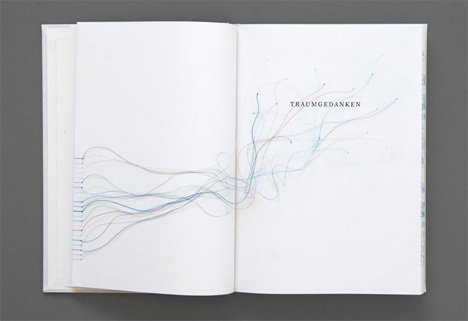 Designer Maria Fischer produced the book “Dream Thoughts” as her diploma project at the University of Augsburg, Germany. The book is a tangible model of the most intangible subject: dreams. Scientific, literary and philosophical texts about dreams are arranged on the pages to give a conceptual understanding of the many different aspects of dreaming. But like a dream, nothing in this book is quite that simple. Various terms and concepts are “hyperlinked” within the book. 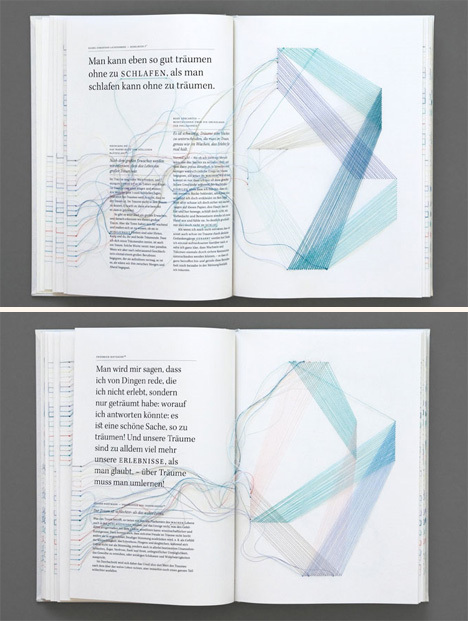 Like internet hyperlinks, these physical links lead to related information. But of course, these links are not established with computer code; they are made with thin pieces of thread. 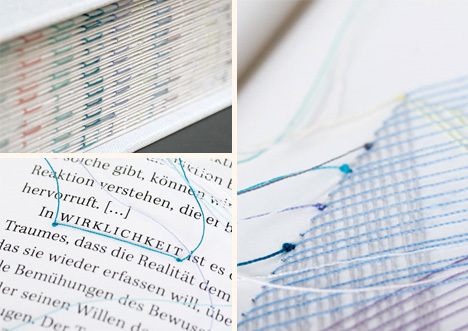 The threads wind their way through the pages, across plains of paper and from one word to its distant partner. Their various colors paint a type of abstract picture with no particular form and no particular meaning other than that of unifying various parts of this unusual text. 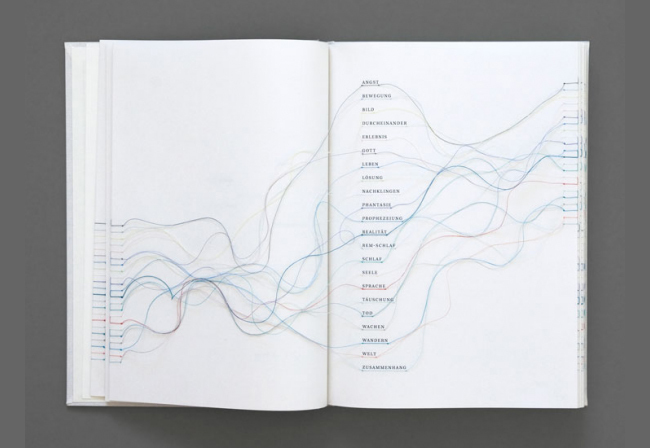 The winding, flowing forms of the threads offset the more concrete, stable words on the page to create a visual representation of the various parts of the stories our minds create while we sleep. 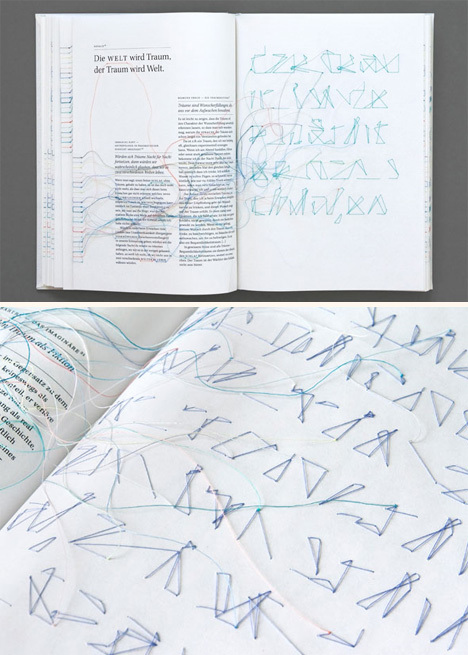 One page in the book contains a hidden message, spelled out in thread and visible only from the back side. The actual message is hidden within a folded page. Only the negative spaces of thread can be seen from the back, making the message impossible to read. The unreadable message embodies almost everything we know about dream interpretation: there is a message there, to be sure, but it lies obscured behind a curtain of interpretation and foggy memory.